This pumpkin macaroni and cheese is creamy and rich (yet surprisingly light). What else would you expect from a skillet full of cavatappi, bacon, Cheddar, pumpkin, and sage? Oh, did we say bacon? I can’t win with this man. But I have gotten good at serving him all kinds of pumpkin dishes: Pumpkin Soup, Braised Short Ribs with Pumpkin Orzo, Pumpkin and Sage Pasta Hats, and my famous Pumpkin Cake With Maple-Cream Cheese Frosting. This year, though, I wanted to surprise him with something different. I had exhausted just about every pumpkin recipe on this site, and then it hit me: This man is a massive cheese ball. (I mean this in the very best way possible.) He loves cheese. On top of that, he literally, truly says, at least once a week, “I could eat pasta every day.” So I did a little math. Cheese + pasta + pumpkin = pumpkin macaroni and cheese. And since it’s near Thanksgiving and everyone will be wondering, What in the hell am I going to do with all this leftover turkey? I have just one answer: Bury chunks of it in this dish. And then make The One proud and serve a chocolate dessert afterwards. This pumpkin macaroni and cheese recipe makes A LOT of macaroni and cheese. Enough for leftovers. This simple fact is epic not just for obvious reasons but because, like all casseroles, this dish actually improves with age—but only if you reheat it with care. Shy away from the temptation to plop it in the microwave as the fats in the sauce separate and all manner of nasty greasiness will ensue. Instead, cover the dish of macaroni and cheese and slide it in a warm oven or scoop the macaroni and cheese into the top of a double boiler and gently heat until it’s warmed through. If your leftover pumpkin macaroni and cheese seems a touch on the dry side as you warm it, just stir in a little whole milk. 1. Place the oven rack in the middle position and crank the heat to 350°F (177°C). 2. Bring a large pot of water to a boil and toss in 3 tablespoons salt. 3. While the water is coming to a boil, melt 1 tablespoon butter in a 12-inch cast-iron skillet over medium to medium-high heat and stir in the panko. Season with salt and pepper and stir until the panko are coated with the butter. Scrape the panko into a bowl. 4. Fry the bacon in the same skillet over medium heat until crisp yet still chewy, 5 to 10 minutes. Transfer the bacon to paper towels or a brown paper bag to drain. Roughly chop or crumble the bacon. 5. If there’s enough fat in the skillet to cook the onion, great. If not, add a tablespoon or two of butter to the bacon drippings. Cook the onion over low heat, stirring often, until softened and golden, about 20 minutes. Add the garlic and cook 3 minutes more. Scrape the mixture into a bowl. 6. Meanwhile, dump the pasta in the boiling water. Give it a stir to prevent it from sticking and cook it 2 minutes less than specified on the package. (Trust us. The pasta will continue cooking in the oven.) Drain the pasta. 7. Melt the remaining 4 tablespoons butter in the skillet over medium heat, add the sage, and let sizzle for a minute. Dump in the flour and whisk constantly for 1 minute. Raise the heat to medium-high and slowly pour in the milk, whisking continually. Repeat with the cream. Whisk in 2 cups cheese until it melts. Add the reserved bacon, onion, pumpkin, vinegar, thyme, nutmeg, 2 1/2 teaspoons (9 grams) kosher salt, and freshly ground pepper to taste. Take a taste and add more salt or pepper, if you wish. 8. Dump the pasta into the skillet and stir to combine. (Alternately, you could dump everything in a 9-by-13-inch baking dish.) Top with the remaining 1/2 cup cheese and then sprinkle with the buttered panko. Bake in the oven until bubbling and the panko is lightly browned, 25 to 30 minutes. 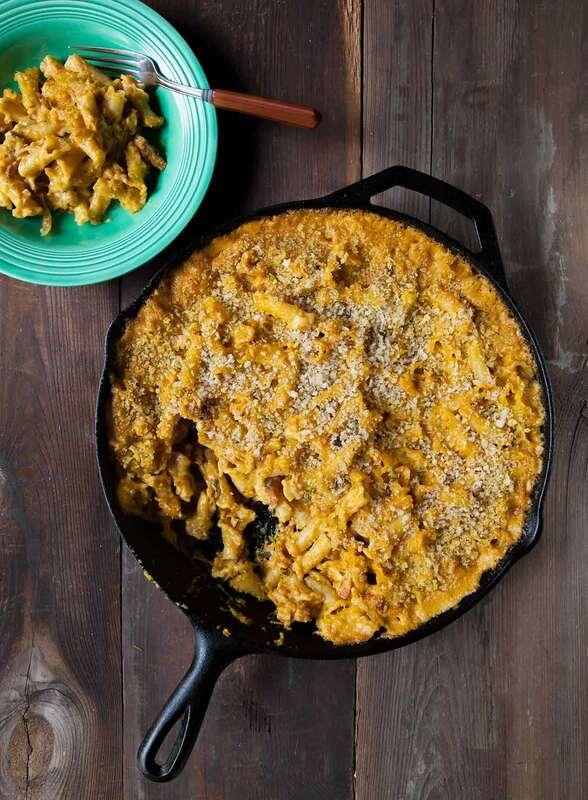 Let rest for about 10 minutes and then scoop and serve the pumpkin macaroni and cheese straight from the skillet. This pumpkin macaroni and cheese recipe is amazing. The addition of pumpkin gives such a warmth to the macaroni and cheese although it doesn't taste like "pumpkin. So don't think sweet. Think a rich, cheesy sauce with a beautiful, deep orange squash-like taste wrapped around little pasta shells. This dish is a little time consuming. The cheeses I used were extra-sharp Cheddar and a little sharp white Cheddar—a favorite combination of mine. After adding it to the flour and milk mixture, it created a lovely cheese sauce that looked amazing. The pumpkin rounded out the creaminess and mixed perfectly with the cheese sauce. The It was bubbly and looked great! The final outcome was a beautiful creamy macaroni and cheese with a wonderful hint of pumpkin. Again, don't think of sweet pumpkin. This an amazing recipe and you really should try it! This pumpkin macaroni and cheese recipe makes a sophisticated version of a classic macaroni and cheese that's well worth the extra effort. Fall flavors of pumpkin, sage, and thyme complement the cheese and tender pasta, and the panko made a light, crisp, buttery topping. The sage and thyme come through very well in the sauce. I used a 500-gram box of mini penne pasta and half a 796-gram can pumpkin purée. This might have gone faster if the bacon had been rough cut before cooking. The bacon produced a lot of drippings so there was no need to add any additional butter to the pan for the onions. In fact, there were enough drippings after cooking the onions and garlic that I could have substituted that for 2 tablespoons the butter in the roux. Caramelizing the onions and cooking the garlic was right on in timing. The sauce, once made, was quite thick. When I make this dish again, I might decrease the amount of cream to match the milk. The sauce, while delicious was a little heavy, for my personal taste. Also, I would use all the bacon in the package as there were only 3 slices left. Things can always use more bacon, right? Other than a couple minor tweaks for personal preference, this is a lovely recipe as written. This pumpkin macaroni and cheese recipe was so good that we all had second helpings. This took close to an hour hands-on time. Itʻs extremely involved. The sauce was very thick but held itʻs own in the oven—that is, the whole casserole remained moist. I used a 13-by-9-by-2-inch pan. The flavor was very good. The texture was creamy, even though the pan went into the oven uncovered. The panko provided a nice crunch. I think this was very involved for macaroni and cheese. I think Iʻd look for ways to simplify the recipe somehow. I might also look for ways to cut some fat and still retain the flavor and texture. This is wonderful cold weather comfort food at its best. That's the short and sweet review for this recipe. There is nothing I would change here. Other than the lovely flavor and texture, I loved the weight measures even for the onion! All measures worked great. Below are some details. For something like this, I always chop the bacon before frying. It's quicker and renders the bacon fat better. You can also cook it in a smaller pan if needed. The sauce had a very nice consistency. It was thick and creamy and coated the elbow macaroni perfectly. This can easily serve 8 as a main or even up to 12 as a smallish side dish. Out of the oven it is perfectly cooked with a bubbly sauce and great texture. The flavors work so good with a great balance of sharp cheese (I used a mixture of Cheddar and Gruyère that I had on hand), caramelized sweet onions, and herbs, all rounded out by a touch of cider vinegar. Oh my. I'm not a fan of overly cheesy mac and cheese but this pumpkin mac and cheese is fabulous. It's rich but not heavy and the pumpkin and sage really give it a great depth of flavor. I used elbow macaroni but next time I would use small shells. My bacon crisped up nicely and, in fact, crumbled in my hands so I didn't need to cut it. I actually used 2 different pans—one for the panko, sage sauce, and the rest of the macaroni and cheese and another for the bacon and the onion. Felt like a lot of dishes but it was a lot cleaner. My sauce was a lovely, smooth consistency. The finished product was very creamy. It's really rich. We served it as a side dish with smoked roasted chicken. Pumpkin Macaroni and Cheese Recipe © David Leite. Photo © 2015 David Leite. All rights reserved. All recipes and photos used with permission of the publisher. This looks wonderful and except for the bacon, the ingredients are everything my family loves, except for the bacon, which we don’t use in our home. Can you think of any good substitutions? I was even thinking chopped Apple? Not because it’s bacon-like, but because it might go so well with the sharp cheddar and contrast nicely with with rich creaminess???? Obviously it wouldn’t render fat..but the flavor profile just could work? Lynn, I’ve never made it with apple, but it could work, sure. Let me know how it turns out! I made this last night and my family raved about it. So good! Very rich, though. I did substitute 2% milk for the whole milk and turkey bacon for the pig bacon. Like some other commenters, I also chopped the bacon before cooking it. Turkey bacon has much less fat so I needed some extra butter for the onion. It was a great way to use some of the sage and thyme that are still growing in my garden. For the pasta I used some Trader Joe’s fall butternut squash pasta shaped like little pumpkins. Delicious! Superb, Amy. And I hear you: I was looking for all kinds of ways to use up the sage in the garden. In part, that’s what prompted me to develop the recipe. Chris, shouldn’t be a problem. Just make sure the sauce thickens properly, as cream is thicker than milk. And YOU know what I’m talking about with turkey…. !